From a boy who wanted to be a swashbuckler like Errol Flynn to a Maine Maritime graduate to hopping aboard a grain ship bound for Egypt, Captain Theodore “Ted” Bernhard has led a quintessential maritime life. A ship driver with 37 years of maritime experience, Bernhard has spent half of his adult life at sea, the last 20 years on containerships with Matson, the ubiquitous U.S. commercial maritime presence in the Pacific Ocean. Life at sea in 1979 – with no cell phones, no internet and no email – was fairly different than it is today, but was it better? Was it worse? 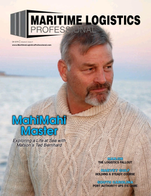 To find out, Maritime Logistics Professional spent an afternoon with Captain Bernhard to discuss the ever-evolving life of a U.S. Jones Act fleet mariner. While every mariner’s career story is unique, the trajectory of Bernhard’s path is perhaps familiar to that of many of his contemporaries: the ‘70s to the ‘90s were more youthful and carefree, while the mid-90s to today are more structured and time-conscious. Father Time is not the sole culprit in this transformation, as the maritime industry itself, driven by consolidation and corporatization, driven by increased levels of regulation and legal liability, driven by technology that has seen the ship become a 24/7/365 monitored piece of an overall logistics puzzle, have changed the industry to its core. “It was tough shipping in those first 10 years because it was a story of too few ships and too few jobs,” said Bernhard. “But it was also a free style of living; I was single, I was traveling the world and I was living in different countries.” By late 1980s, though, he tired of sailing as a junior officer, and was presented some opportunities that served as a launching pad for his career. But things started to change when his APL ship was bought by Matson. “That turned my whole life around,” said Bernhard. Founded in 1882, Matson is a familiar maritime company, the leading U.S. carrier in the Pacific providing a lifeline to the economies of Hawaii, Alaska, Guam, Micronesia and select South Pacific islands. Its fleet of ships includes containerships, combination container and roll-on/roll-off (ConRo) ships and custom-designed barges. Matson Logistics was established in 1987 and extends the geographic reach of Matson’s transportation network throughout the continental U.S.
Matson has been a steady hand in the U.S. maritime puzzle for generations, most recently announcing a $511 million order to buy a pair of new ships from General Dynamics NASSCO, a wholly owned subsidiary of General Dynamics (NYSE: GD), to build two new ConRo vessels for its Hawaii fleet at a contract price of $511 million for both vessels with deliveries scheduled for the end of 2019 and mid-year 2020. The new Kanaloa Class honors the ocean deity revered in the native Hawaiian culture and the company will name each of the new vessels after predecessor ships from its 134-year history. The first vessel will be named Lurline, the sixth Matson vessel to carry that name, while the second vessel will be its fifth named Matsonia. The Kanaloa Class vessels will be built on a 3,500 TEU vessel platform, measuring 265 x 34.9m, with a deep draft of 11.5m and enclosed garage space for up to 800 vehicles. Central to the Matson way, the new vessels will have green technology features: a fuel efficient hull design; environmentally safe double hull fuel tanks; a fresh water ballast systems; and dual-fuel engines, able to operate up to 23 knots on either conventional fuel or LNG (with adaptation). According to the company, the larger capacity of the Aloha Class and Kanaloa Class vessels will allow Matson to return to a nine-ship fleet deployment in Hawaii, increasing efficiency and lowering operating costs. Captain Ted Bernhard is a Master Mariner, sailing with Matson for 20 years, three years as chief mate and 17 as master. In addition he has spent more than 30 years in the Naval Reserve, and taught ship handling at the Naval War College in Newport, R.I., during the last 12 years of his reserve service. He sees a looming gap in maritime talent coming to the fore, as the push button/joystick generation is perhaps not as interested or adept in dealing with the ups and downs of a life at sea. He views new technology as a mixed blessing: new technology has had a tremendous effect on making shipboard operations easier in some regards, but it has come with an erosion of basic seamanship skills, a sentiment that is increasingly common in maritime circles. Advances in technology are certainly not limited to maritime operations, as crew amenities continues to be a prominent topic from management to seafarers alike. The previous generation’s life at sea was essentially unplugged from routine communications for weeks at a time, and many of the colorful anecdotes told today were in fact oftentimes difficult. Bernhard in fact says that communications from ship to shore is likely the single biggest change in seafaring life today, as with phone calls, email and internet, constant connection is available, and indeed necessary in order to attract and retain the younger generation to a life at sea. But similar to the technology driving marine operations, the advantages of enhanced amenities at sea is not always black and white.